Apparently analysing yourself is this quickest way to improve so here I go. 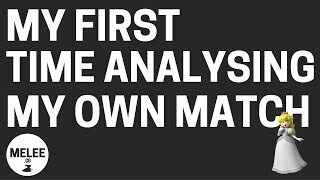 Here’s me analysing my first match. Hey guys, Ryan here from Melee.co and I went to the meet up or the Smash fest – I guess you would call it, last night; played for a few hours. There were only 4 of us there; 1 player who was worse than me and 2 players who were better than me, and we did a round robin. And so I won 1 game, lost 2 as expected. There was one guy who was a …0:22… and we are pretty even but whenever it comes to actual brackets or things like that, he always wins. Whenever we are playing friendlies, for some reason I seem to win. So, I do not know if that is just because he is not taking it seriously or if I do not get as stressed in friendlies. But what I am going to try and do in this episode is to actually go through some of the matches that I played in the round robins. There was no money involved or anything like that; it was not going towards anything but, it was a little bit more serious that friendlies because we were trying to win. And so, I want to try and go through these. I have never really watched myself and analyzed myself so bear with me because I am definitely a rookie in this area. I just watched an episode of Zero to Hero – Season 2 – Episode 5 with ….1:16…. and he talks about how to analyze videos. And so, if you want help analyzing videos, just type in Zero to Hero ……… season 2 episode 5 into YouTube and you will find it. I absolutely love that series. He said, when we are analyzing videos we are aiming for modular development because if we try and work on too many things at the same time, generally we get nowhere and I definitely agree with this. I talked about that in (I think) the last episode, where i try and work on my worst thing at that point in time. And so, he then talked about 4 different things you want to look for in videos. Number 1: what hit me at every moment so every time you get hit, what actually hit you? Number 2 is what action led to that hit so how did you end up in the situation where you got hit? Number 3: was I in a bad situation and number 4, what led to that bad position? So, these are the 4 things we want to analyze throughout the video and once we do that, we then want to go ahead and make solutions. So, we ask ourselves questions that we can find solutions to. So let us say I keep getting hit by Matt’s forward smash, I need to make solutions of things that I could do so I do not get hit or something like that for example. And so, let us get into this. Just so you know, this was my first time streaming, first time recording and so it is quite jumpy. The footage is not awesome but it is all I have to go off and I figured that is better than nothing so I am going to go ahead and use it. Let us bring up the first match, it was the best of 3, against Thatch, who is a Math player and let us go ahead and have a look at this match. Now, I might just mute the sound so that it is not impeding on what I am saying but you will be watching a complete scrub-myself going through this video in a complete scrub way because I really do not know how to analyze videos. So, we just decided to go straight to battlefield because if we are going to strike we are going to end up there anyway and so really, let us actually slow this down. Actually, let us watch it on normal first and then we will slow it down a bit. So, we can see I got grabbed there; maybe we will go back and have a look at why I got grabbed so let us go ahead and put this on half speed. I am actually thinking that maybe I should start with neutral starts because that would allow me to grab and turn up in a better position. So, I pull a turnip. I am dash attacking. I throw a turnip underneath his short hop neutral air. And so, we both kind of whiff there and then he jumps then I did a down smash. So, running, I missed the turn up down smash obviously, not a great option, which allows him to run in. Now, I did a down smash and then after this down smash, which we missed because of the junky video, I then run away and I believe I am going back to try and dash attack and I thought about this before. One of the things that I do is tend to spam dash attacks. So, I get caught running in. I definitely did not respect his range and I guess that is just part of me focusing on my character rather than looking at the stage and looking at his character. I find when I am playing I am always watching my own character. So, I get grabbed. I float above him, get hit and get ….5:05….. What tends to happen against Thatch is that often in our first stock, he would just juggle the heck out of me; he will destroy me and I will end up with like 20% against him, and then I am fighting my way back. And so, we can see this happening now. Okay, we get juggled. So, I get down and then again I whiff out a dash attack there for no reason. So let us just say, alright. He is above me and then I throw out a dash attack where really , I could have just controlled space. I probably could have pulled a turnip. I get caught on I think it was a fair and falling, he tries a downtilt. I catch him down smash. I then went for a ….5:55…. and this is something that can be good against Marth but I just ….5:59… how to use it yet. I think I need to be higher. I need to work out with the hitboxes are, where Marth’s stuff come out. And now I get hit really I recover so I should be able to wavedash back there to get more space but unfortunately, I do not. Video cuts. Tumbling down, I grabbed the edge. I am going up and then I just go straight into his range. And so it is hard with Peach because you had such limited ledge options. Oh, we can see I tried to throw out a fair. This is something that I sometimes get hit on, the fair. Like sometimes, when they are downtilting however, Thatch is better than this and I should know. He downtilts and he sees me coming up and he stops downtilting because I am hitting with too many fairs in the past. And so I can throw out a fair, definitely, dod not respect him. I probably should have air dodged up to the platform or edge I just threw him or something like that; coming back down. I expected him to come in but I should have watched what he was doing. Maybe, I should have run away because I am not in the best position here to actually do anything. So, really I could have run away, seeing what he did; maybe hit with something so really going straight into preemptive down smash did not help my cause because he was nowhere near me and I am throwing it out. He runs in with the dash attack. I am now floating in a pretty awful position. I did not want to end up on that stage because I was too scared of getting tipped. And so I was taking my time; he throws out a forward smash there. I probably could have grabbed that turnip or something. Now, here is something that I hope I do not do but I do a lot – I do not realize I am over 100% and not try and stand up and I will just get destroyed. But I did not do it then. I thought I was out of range here so let us see how close. So, he will often stand in the same position to hit me and so I am floating just above the edge. I thought I was out of range of him but obviously, I was in range. So really, I need to be a bit farther back than that.